The orb spider is a very common insect in gardens, homesteads, forests and fields. It is known for its impressive circular web it weaves to catch its prey. 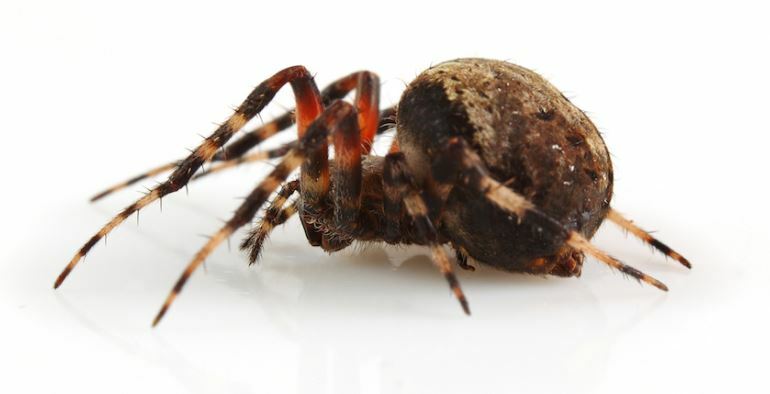 Since they can easily be found in homes, orb spider bites may be thought to be dangerous to humans. However, they hardly bite, and when they do, their venom is not toxic to humans. So, when they bite, what are their symptoms? Can they kill you? Here are pictures for identification and treatment options. What is an orb spider? Is an orb spider bite poisonous or not? In general, they hardly bite unless provoked. Orb spiders are non-aggressive. They are therefore not classified as dangerous. However, they can still bite especially in self-defense. However, they are harmless and their venom is not toxic. Other symptoms include nausea, vomiting, pain in the abdomen, headache, partial loss of control of muscles and increased general discomfort. The garden spider is brown in color though it can at times be grey. They have a triangular shaped abdomen with humps that you can easily notice on their front side. They may have white or brown color on the edges. They live in webs that are located in the openings of trees and shrubs. Their webs are large, vertical and large. They build their webs in the evening but destroy them in the morning. The spider spends time lying as it waits for its prey. The spider become reactive and bite when they sense that something that looks like a prey comes to their web. They know this through sensing the vibration. The moment the spider is sure of the presence of the prey, they bite. After that, they stay back and wait for the instilled venom to take effect. This therefore implies that once the spider bites you, it leaves the venom circulating in your bloodstream. You hence ought to remedy this within the shortest time possible. These spiders are however in most cases very reluctant to bite. This is the biggest of all the spider species available. A typical adult spider has a length of about 20 millimeters. Its abdomen is very large with spots that are brown to purple. There are others whose abdomens are white. The spiders live in trees, shrubs and all the weeds. You will find them in the woodland areas and the banks of rivers and streams. These spiders are not considered very poisonous. It has venom which is not poisonous. It is good to know that these spiders only bite on rare occasions. This therefore means that they do not pose any threat to humans. They have eight eyes and despite this, they have poor vision. In that regard, they don’t depend on their vision to identify and hence bite. They detect vibration and then capture and bite. These spiders are also known to build their webs in the evening and then destroy them come morning. The bites from these spiders are harmless. This therefore means that you should leave them alone at home. They tend to shy away from any bright light and hence keep in the dark. In most cases, they will die when the weather is not conducive. 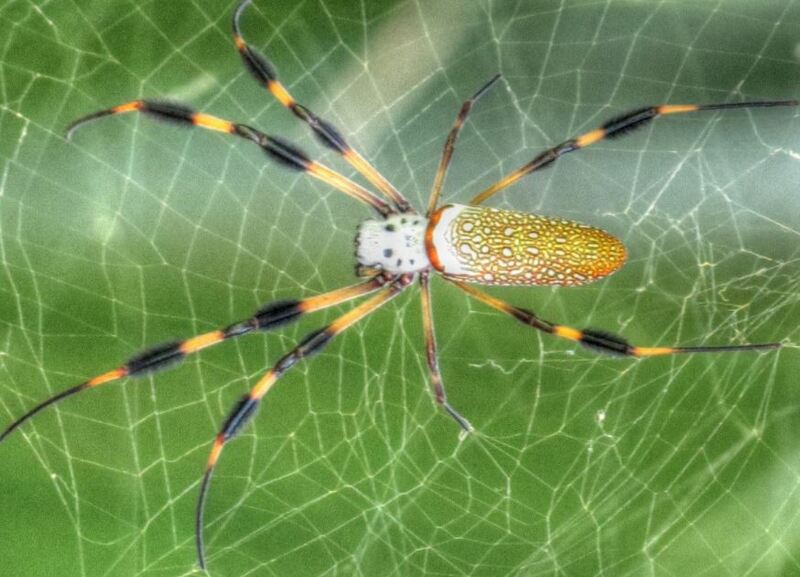 The golden orb spider is also known as the banana spider. It stays in deserted places and homes. Its abdomen is yellow hence the name. The female spider is bigger than the male one. The female’s size is about 40 mm while the female one is about 6mm. When the spider bites, it results in a lot of pain around the bitten area. Despite this, the bite is less severe compared to that of the bee. Interestingly, the bite from the spider is not poisonous and hence no need for panic. It is said that the bite from the spider is like that used by black widows. It is however less powerful. You will see some redness, blisters, swelling and get some discomfort. Silver orb spider is a silver colored and oval shaped spider. It has black patterns on its body. It has very long legs with the head having yellow and dark green. The spiders live in tropical areas and very moist areas. These spiders build their webs around shrubs or near water sources. They feed by targeting the flying insects that stop around the water sources. They hunt both during the day and at night. They trap and feed on their prey once they identify them. The spiders therefore feed on other microorganisms. They are however able to bite when you interfere their habitats. They will instill venom into your skin once they bite you without them being twisted or caught in the bite. 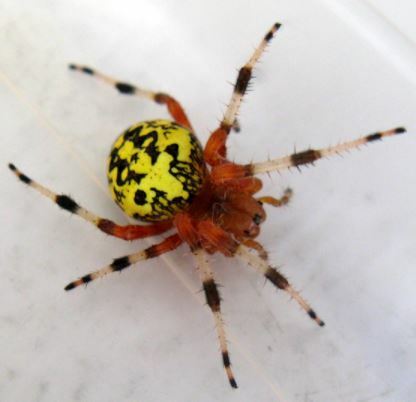 When bitten by this spider, it will take about 12 hours for the signs to show. The bitten area thereafter becomes red and inflamed. After a period of about 24 hours, some sore will start forming. You will afterwards feel a lot of pain. In order to determine the effect of the poison, it depends on the type of spider. As discussed above, there are spiders that produce venom that is poisonous, while there are spiders that give venom, but should not worry you. The best thing you can do is to ensure you avoid any chances of being bitten by spiders. This is because it might not be easy to distinguish between the venomous and non-venomous spiders in the long run. The moment you are bitten by a spider, the first thing is always to try remain as calm as possible. If you get tensed up, your heart rate is likely to increase. In the long run, the venom will move faster through your blood stream. The bitten area should be as low as possible so that the venom remains localized. Having done that, ensure that apply pressure to the area. Having done that, bandage the area so as to avoid the venom from spreading any farther. You could also put an ice pack to the area. You should also take the spider to hospital with you for identification. Apart from the above, you could undertake supportive treatment methods. For instance, you could consider non-steroidal anti-inflammatory drugs. More to that, there are antihistamines and antiemetics that you can use. On rare occasions, you can use beta blockers, benzodiazepines. They are especially useful in treating systemic infections. There are antibiotics that have found usefulness especially in treatment of secondary infections that occur with time. Besides, there are drugs that are called antivenoms that you can use. They are mainly for treatment of the bite caused by widow, funnel web spiders. You could also take redback antivenom. You can take this several times in a day and you will get relief. It however lacks proof of consistent benefit. To ease the pain, you can apply some topical anesthetic agent. This includes topical benzocaine and solarcaine among others. This works best if you apply it as soon as you are bitten. You could also use witch hazel. This is useful because of its astringent properties. you should soak a gauze with witch hazel and then apply it to the spider bite. Vinegar is also useful. It is essential because it soothes the pain that comes with the bite. You should soak a cotton ball into the vinegar and then apply to the spider bite. You will get relief within no time. You could also use some ice on the bite. This helps to relieve the swelling that is a source of so much discomfort. Get some ice cubes in a towel and then pass over the area slowly till some relief is achieved. Carry out this for about 15 minutes. Cleaning the wound with some clean cold water and soap is also a remedy. It is essential as it helps to flush the toxins from the bite. This therefore eliminates the possibility of the venom spreading into circulatory system. It also helps to reduce any swelling. Bite Rx. It is a high potency natural product. It is used to reduce pain and itching that come with spider bite. More to that, it reduces any risks of infection and swelling as a result of the bite. It is made from oils that have anti-inflammatory, pain relieving and antibacterial properties. Activated charcoal. It is an adsorptive product. Because of this, it is able to draw the venom from your circulation to facilitate its removal.